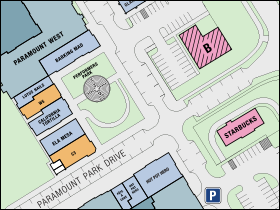 Spectrum’s mixed use community features restaurants and various shops all within walking distance of luxury apartments such as the Majestic, Paramount East, and Paramount West. Our current retailers include Firebirds Wood Fired Grill, Barking Mad Cafe, California Tortilla, One Glance Salon, Jo’s Comfort Zone, Lotus Nails, and Apple Cleaners. As the community grows, we can expect to see Vivi’s Bubble Tea, Smooch! Studio, and UU Hot Pot and Keba soon! Located right off of MD 355 and Watkins Mill Road, across from Bruster’s Ice Cream, and less than one mile north of Costco. Click to view our Community Map.